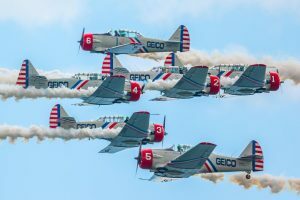 The AeroShell Aerobatic Team with their four incredible North American T-6 Texans will perform both day and night air show performances at SUN ‘n FUN this year. 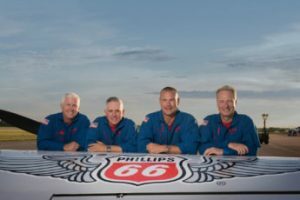 A perennial favorite, the AeroShell team has been performing for more than 32 years, amassing thousands of hours in front of millions of air show fans all across America, and have recently need inducted into the ICAS Foundation Airshow Hall of Fame. Big smoke, and the roar of four Pratt & Whitney Wasp 1385 radial engines will once again thrill both young and old! Bob Carlton began flying in 1979 at the age of 19. He has since logged over 2000 hours in a wide variety of aircraft and holds a commercial pilot certificate. Bob has flown hang gliders, airplanes, helicopters, and sailplanes from hundreds of sites in the US, Canada, Mexico and Australia. Bob has flown airshows professionally since 1993.Bob is one of the most versatile airshow performers in North America. He began flying airshows in his Salto sailplane, and over the years has continued to add innovative performances such as barnstormin’ biplane aerobatics. He has added Sonex as a sponsor, and now flies the super SubSonex personal jet in an amazing aerobatic display! Matt is recognized as an extraordinary aerobatic pilot who thrills millions of airshow fans each summer. He began flying aerobatics in 1984 and quickly worked his way up to the highest level of competition aerobatics – the Unlimited category. Recognized for his skills, he won one of only five slots on the U.S. Unlimited Men’s Aerobatic Team in 1996 and 1998. Matt is a respected voice in the airshow business, with a reputation for safety and diligence. Matt enjoys building and flying radio-controlled aircraft of all types. 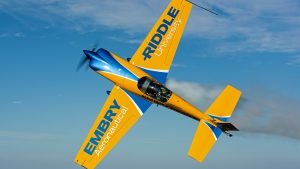 Matt is proudly sponsored by Embry-Riddle Aeronautical University. A pilot for more than 45 years and a retired Northwest Airlines Captain, Julie Clark has logged more than 33,000 accident-free hours in the air and is rated in more than 66 types of aircraft.Marking her 36th year as a solo aerobatic air show pilot, Julie has earned the admiration of fans everywhere and garnered many awards and honors. 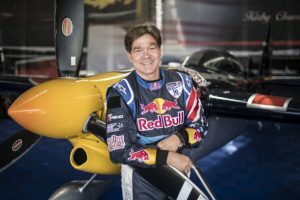 Kirby Chambliss is one of the most outstanding pilots ever to fly in the Red Bull Air Race. He can boast two World Titles and 10 race victories, which puts him third on the all-time wins list. The American with the never-say-die spirit has been a leading force in the sport throughout his career that began in 2003. His prowess in the raceplane has seen him on the podium in 11 of his 12 seasons, a remarkable string of consistency that was only snapped in 2014. During his high school years, Chambliss fuelled aircraft to earn extra money and was soon working as a night freight pilot. His aerobatics career began in 1985 and he won five US National Championships in the Unlimited Level. He was the 2000 Freestyle World Champion and has won 13 World Championship medals. Chambliss has been flying the Zivko Edge 540 and he jokes that he has flown the plane so much that the controls and wings are mere extensions of his own arms. Chambliss is married to fellow pilot, Kellie, and they live on the “Flying Crown Ranch” in Arizona with their daughter, Karly. Kevin Coleman is the first American to fly in the Red Bull Air Race Challenger Class and – born in 1990 – he’s one of the youngest pilots ever to contend in the Red Bull Air Race. 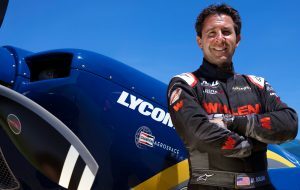 Also a longtime airshow performer and a former member of the U.S. Advanced Aerobatic Team, Coleman captured seven race podiums in his first two seasons of Challenger Class competition, including two wins. A Louisiana native, Coleman comes from a family of airshow pilots. He started flying and taking aerobatic lessons at age 10, taught by American aviation legend and Aerobatic Hall of Fame member Marion Cole. Coleman soloed on his 16th birthday and followed his Private Pilot’s Licence with a commercial licence two years later. He worked as a flightline technician while earning a bachelor’s degree in aviation management from Louisiana Tech University, then launched his full-time aviation career. 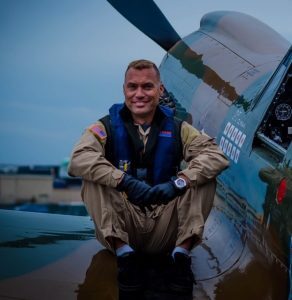 In addition to his current competitive career in racing and his performances in airshows, Coleman works as a contract pilot, while on the ground his passion is the Marion Cole Memorial Scholarship, which he founded to assist young people interested in aviation. A native Californian, Greg took his first flight at the age of seven in a Cessna 172. He has been hooked on flying ever since. He has been licensed since the age of 18, after learning to fly while serving in the U.S. Army from 1982- 1987. He has been employed by the FAA since he left the service as an Air Traffic Controller at Oakland ARTCC. His love and passion for flying has never left him. Mike Goulian doesn’t just fly an air show; he attacks it. 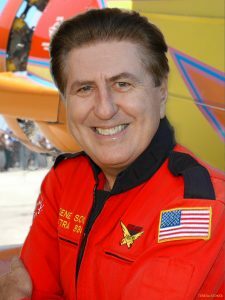 Millions of air show spectators around the globe have witnessed the ferocity of a Mike Goulian air show performance. Every roll, pull, and tumble of his flight is a deliberate execution of precision. With his aggressive approach to the air show arena, Mike Goulian has mastered the ability to convey his message of passion through flight. He is also a contender in the Red Bull Air Race World Championship. There he competes in the prestigious Master Class, flying at exotic venues in front of millions of people around the world. Despite Mike’s successes he remains humble and accessible to organizers and fans alike. This rare combination has made Mike Goulian an unforgettable air show favorite. Auburn University Graduate, 1971. Have been flying for over 35 years. . Over 5,500 flight hours mostly in WW-2 era multiengine transport and bomber aircraft. Larry has led formation flights over the Super Bowl, the Indy-500, and the Preakness Race, Arlington Cemetery, The Pentagon, and Multiple NASCAR races as well as appeared on both the History Channel and Military Channel. For 11 years Larry has represented the Disabled American Veterans (DAV) at over 150 air shows across the country as the Disabled American Veterans Flight Team lead. Lt. Colonel Jerry “Jive” Kerby, USAF (ret.) takes the RV-8A known as Wild Blue through heart-stopping maneuvers in the sky guaranteed to thrill. With over 13,000 hours of flight time in more than 60 different types of aircraft, Jive has been flying for 40 years and started flying on the air show circuit as a performer in the F-4 Phantom in 2005 while still serving active duty in the United States Air Force. Having flown the F-15C Eagle as well as the F-4 during his 23-year career in the USAF, Jive is still flying fighters as a civilian pilot, including the F-4 Phantom, the A-4 Skyhawk, and the MiG-17. Greg Koontz learned to fly in 1969 getting his Private Pilot Certificate when he turned 17 years old. In his senior year in high school, Greg restored a 1946 Piper J-3 Cub in his mother’s garage and flew the antique plane for 300 hours to gain experience for a flying career. At age 20, Greg got his start in the airshow business when he bought another Piper Cub from Ernie Moser in St. Augustine, Florida. Today Greg is a full time airshow and aerobatics professional. Since 2003 he has been sponsored by American Champion Aircraft which supplies him with new Super Decathlons to demonstrate in front of millions of people each year. EAA Warbirds of America 2013 Hall of Fame inductee, is President and CEO of Stallion 51 Corporation located at the Kissimmee Gateway Airport, Florida. Stallion 51’s innovative and comprehensive curriculums have instructed thousands of pilots on the correct and safe methods of flying both the legendary P-51 Mustang and the historic T-6 Texan for over 26 years.Lee started flying sailplanes at age 14 and launched his corporate aviation career immediately after college at the top flying noted professional golfer, philanthropist and businessman, Arnold Palmer.Lee is a graduate of Embry-Riddle Aeronautical University in Daytona Beach with a degree in Aeronautical Science and Business Management. Lee is also a Master Falconer and when not flying himself he can be found flying his hawks and falcons. David Martin flies a unique air show in an aerobatic Beechcraft Baron! Extraordinary maneuvers in any plane, but to do this in a light twin-engine aircraft is truly something special. With a strong background in competition aerobatics, David’s air show is a combination of precision and amazing maneuvers. Jim Peitz has come a long way from a Piper Cub on the Prairie outside Pierre, SD where his father taught him how to fly. He taught him well – since 1975, Jim has amassed thousands of hours in over 90 aircraft models without so much as a single scratch! He believes that aviation is one of the greatest freedoms we enjoy in this country, and nobody probably enjoys it more than Jim Peitz as he flies his Beechcraft F33C Bonanza in an aerobatic demonstration that will leave the pilot in all of us completely mesmerized. Manfred Radius began flying sailplanes in 1961 at age 17 in Hamburg, Germany. He has logged more than 5,000 flights and has accumulated over 2,000 hours in at least 60 types of sailplanes.He performs from coast to coast in North America and internationally as well. Manfred thrilled large audiences when he performed his daytime and night acts at the Australian International Air Show and Aerospace Expo near Melbourne in 1995, 1997, 1999 and again in 2001. Thom Richard displays the dual-cockpit and dual-controlled P-40 Warhawk he aptly named “American Dream” in his surface level aerobatic demonstration. For a day job, Thom teaches at his Kissimmee, FL based operation, Warbird Adventures, the world’s only full time T-6 and P-40 flight school, where you can learn all aspects of Warbird flying, including full type checkouts as well as introductory flights for the novice, or even get your private pilot’s license in a taildragger, if you like. Thom also performs aerobatic airshows in Mustangs and Corsairs throughout the country as well as teaches in the B-17 Flying Fortress. Of Reno Air Race fame, Thom has raced, Formula One, Jets and Unlimiteds and won the Airrace 1 World Cup. If you’d like to learn any or all of the maneuvers you see him demonstrate in his airshow, go find him or his team in the Warbird area at SUN ‘n FUN and find out how you can get your hands on the controls of the iconic P-40 Warhawk! Gary Rower is a veteran airshow performer. 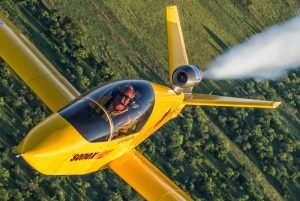 He has entertained audiences all over the United States and in Canada at airshows both large and small. He performs with a Level 1 Unrestricted/Surface Level Waiver.Gary began flying at age 16 from an apple orchard in upstate New York. Since that time he has accumulated more than 21,000 hours of flying all over the world. He currently holds an Air Transport Pilot rating in the Airbus 330, the Boeing 767,757,737 and DC-9 and flies to Europe, Africa and South America. 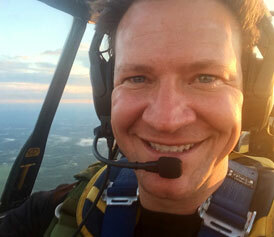 Hailing from Overland Park, KS, RADIAL RUMBLE pilot Jeff Shetterly is a third generation aviator who grew up in Indianapolis, IN and works in the medical device industry. Jeff graduated from the United States Military Academy at West Point with a degree in Human Factors Engineering and served in the United States Army on M1A1 Abrams tanks. He was stationed in Germany and deployed several times to the Balkans, leaving military service in 2001. In the years since, Jeff has become an instrument rated commercial pilot and Certified Flight Instructor, flying single and multi-engine aircraft as well as gliders – 95 different aircraft types so far. Jeff hopes his performances will be an inspiration to both children and adults, and he is constantly humbled and enjoys learning from the veterans who flew planes like “39F” (his 1945 North American SNJ-6 “Texan”) when they were new. Jim Tobul and the “Korean War Hero” F4U-4 Corsair are an exciting tribute to the men and machines that fought to defend democracy and freedom in the Korean Conflict from 1950 – 1953. Jim tells the story of this celebrated aircraft with both dramatic aerial displays and while static on the ground at airshows all over North America.Jim now performs at 18 or more airshows per year, bringing tears to the eyes of veterans and awakening the curiosity of upcoming generations to learn more about the fight for freedom waged by those who came before. 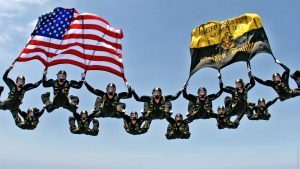 The Para-Commandos are members of and representative of today’s Special Operations Forces. 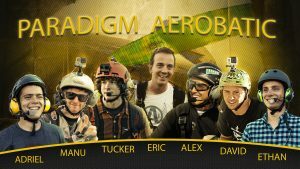 The Para-Commandos are comprised of active duty Special Operators, such as Army Special Forces, Army Rangers, Navy SEALs, Air Force Combat Controllers and Marine Raiders. In addition, the Para-Commandos have a number of support personnel, commonly referred to as Special Operations Enablers. Our enablers come from all four services, and include reserve forces as well. Team owner, Mark Sorenson has teamed up with Mark Nowosielski in their Tiger Yak 55’s displaying a magnificent aerial demonstration of precision and skill during their performance of spectacular formation aerobatics. 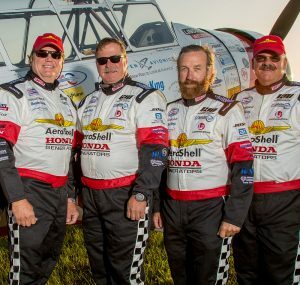 The Team has been featured in aviation magazines across the nation and is a crowd favorite at every show, especially with their no child left behind autograph session with team provided posters. Both Marks are B737 pilots for Southwest Airlines and enjoy inspiring the next generation of aviators when they are not connecting LUVed ones across the country with the airlines. In 2015 Mark Nowosielski was on the US World Aerobatic Team competing in the UNLIMITED category. In 2013 Mark was the US National Advanced Aerobatic Champion. 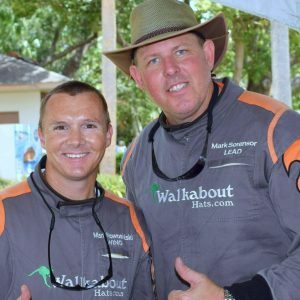 WALKABOUTHATS.com has teamed up again with Mark & Mark as title sponsors in an effort to bring their aerial excellence to everyone across the country. Scott “Scooter” Yoak is the pilot and caretaker of the P-51D Mustang “Quick Silver” The Mission of the Quick Silver Flight Team is to honor and pay tribute to the thousands of veterans that have sacrificed their lives for the freedom and security of others. 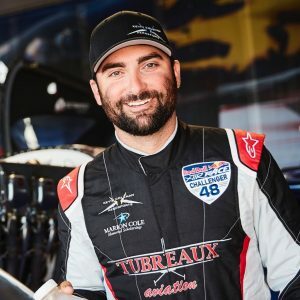 Scott is a 2008 graduate of Embry-Riddle Aeronautical University, Daytona Beach Campus with a major in Aviation Maintenance Science and a minor in Air Traffic Management. Scott flies the Quick Silver P-51D though a fantastic routine that inspires and brings audiences into a bygone era.